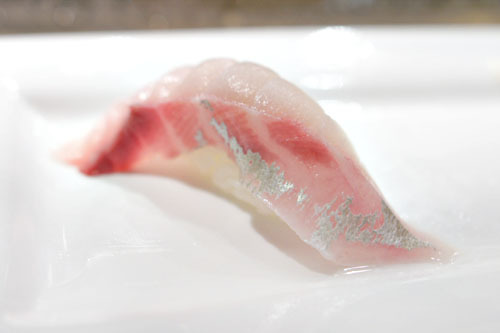 I've always been impressed with the quality-to-price ratio offered at sushi joints in Orange County, places sushi as Ohshima and Nana San where you can get really good sushi without spending triple digits per person (which seems to be the requirement in LA proper). The last such restaurant on my "to-eat" list was Shunka, so I was determined to finally make it out here. 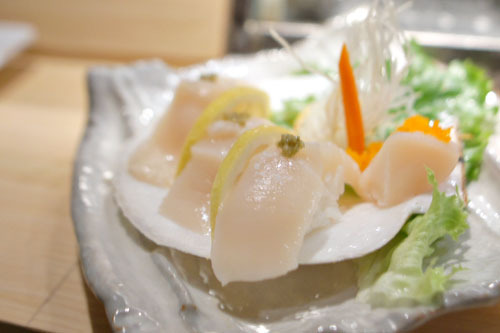 Shunka's the work of Chef/Owner Yuki-san, previously head sushi chef at the longstanding (ca. 1978) Matsu in Huntington Beach. 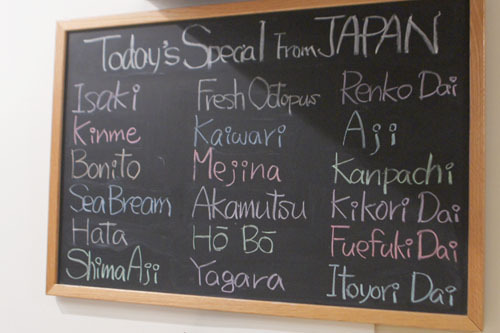 Yuki-san spent over 15 years there before opening Shunka in March 2012. Shunka occupies the space that once held John Arteaga's Frenzy Sushi (tagline: Sushi Gone Wild!). The layout remains basically the same, but the decor's been tweaked to convey a more serious tone. The bar seats about 15, while a few tables line the walls. 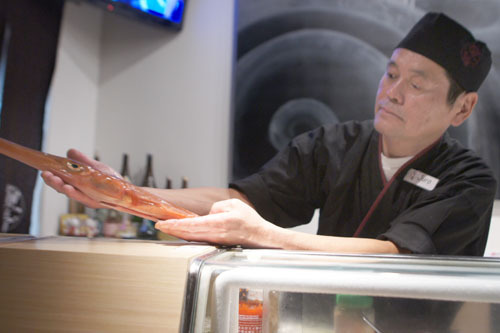 Shunka's menu features your standard sushi fare, though the way to go is to sit at the bar and order omakase. If you insist on à la carte, I would at least pick selections from the specials board. Click for larger versions. 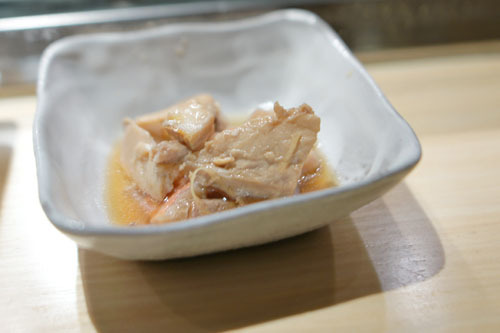 Upon being seated, our itamae Juro-san quickly thrust before us small bowls of snapper, cooked in sake and soy. 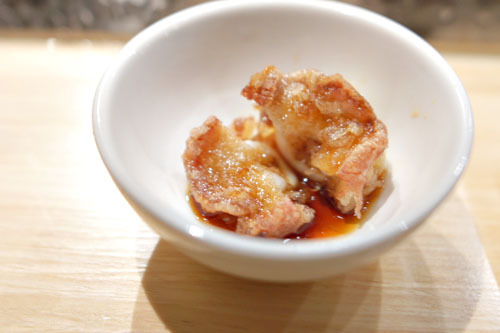 The dish didn't look like much, but was surprisingly satisfying, conveying a firm, dense, meaty texture along with a subtle fishiness that paired swimmingly with the mix of sweet and umami flavors present. To drink, we decided upon a bottle of the Kubota Manjyu [$120], a legendary junmai daiginjo from Niigata's Asahi Shuzo brewery. 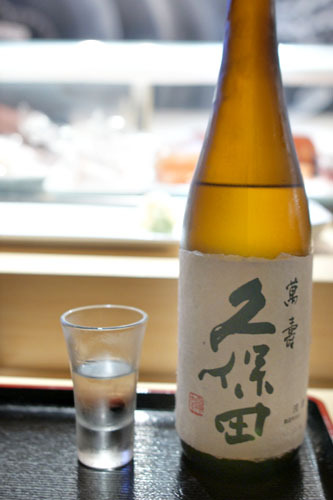 Though the sake's fairly common, it's also unquestionably enjoyable: smooth, silky, and displaying a delicious blend of fruity and floral nuances along with a light touch of crisp, stone-y minerality toward the close. 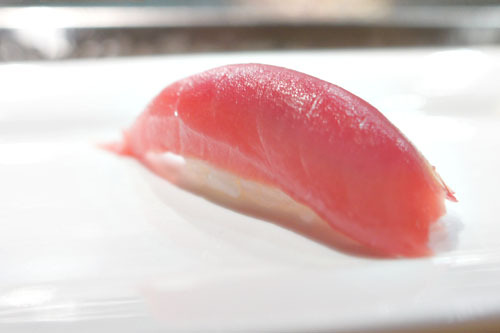 We commenced our parade of sushi with a textbook cut of bluefin, which I found slick and supple, with a mild savor that was brought out by the application of soy sauce. Amberjack, meanwhile, was also on point, with a particularly satisfying consistency and mouthfeel to it. 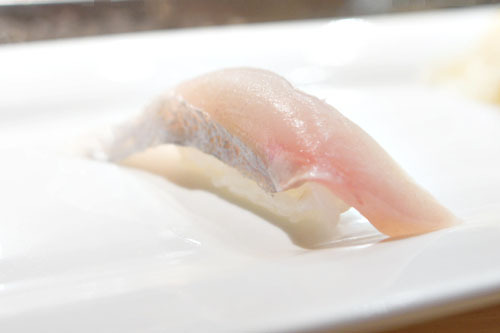 Sea bream arrived clean and crisp, with a fantastic bit of zing from the yuzukosho that really complemented the delicate flavors of the fish. Live octopus was superb: creamy, yet snappy in texture, with a softly salty taste that went perfectly with the spicy condiment on top. 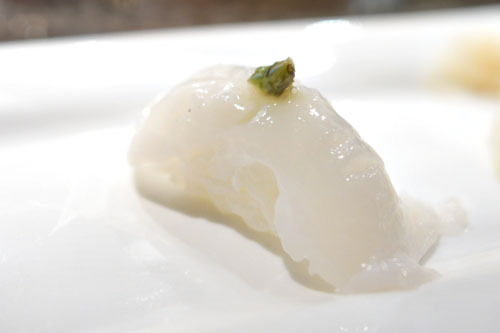 Juro-san then dispatched a live scallop in front of us, presenting the bivalve in its own shell. 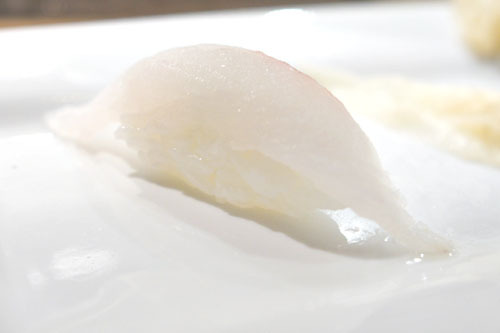 I loved it, reveling in its soft, sweet, saline flesh, perked up by pinpoints of salt and a tiny dab of yuzukosho. I believe these were the suction cups from the octopus above, deep fried to perfection. I really liked the crispness here, as well as the super-savory flavors at play and how they paired with the tangy, umami-laced sauce. 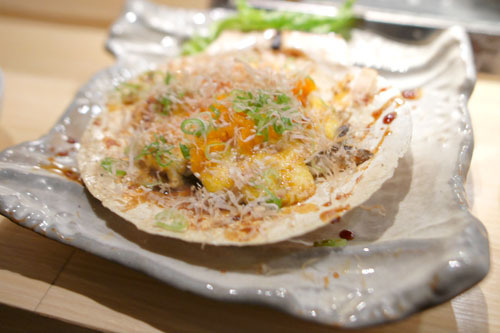 With the remaining "sides" of the scallop, Juro-san prepared what amounted to a scallop dynamite. The hotate's firm flesh worked out surprisingly well against the hot, hearty, and creamy elements in the dish, with the scallion providing a much needed dose of levity to the mix. We were then given cuts of trumpetfish, a real rarity in sushi restaurants that I'd actually never tried before. The flavor on this one was very, very mild, so for me it was all about the texture: soft and supple, but with a very pleasing snap to it. Next, an entire mackerel (a small one) was prepared for us by the Chef. 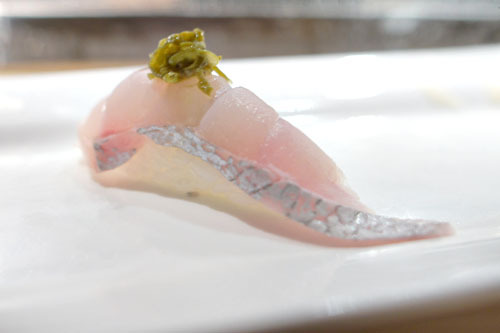 It was very mild, very delicate for aji, with a lovely counterpoint in the form of that ginger and scallion, though I would've preferred less sauce. 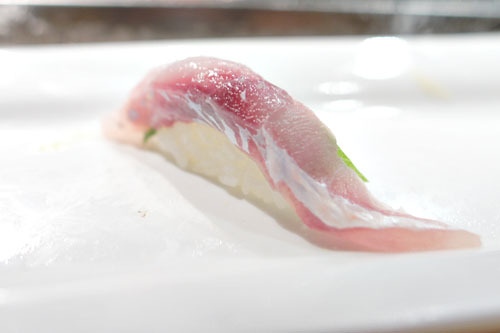 Striped jack was spot on with its crisp, snappy consistency and sweet, saline flavors. Very nice! 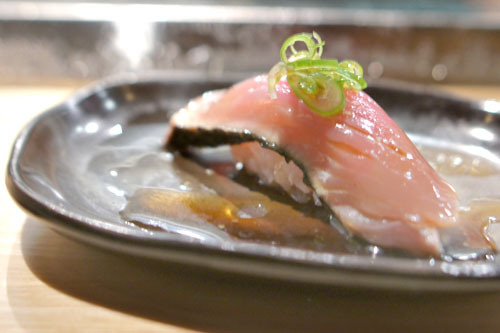 Bonito, or skip jack tuna, gave us a fantastic savoriness that was deftly offset by the scallion. The tang of the accompanying ponzu made sense too, though perhaps less would be more here. 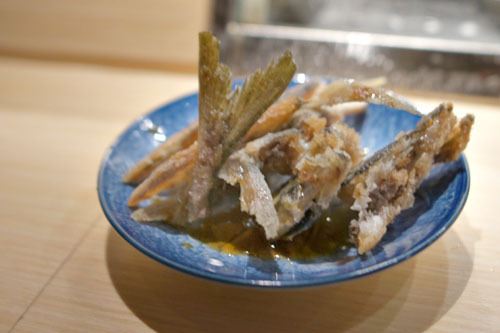 At this point, the remains of the mackerel from above were deep fried to make some delightful bone crackers, which showed off the savory, ocean-y essence of the fish, balanced by a hit of citric sourness. Medai was yet another rarity, something that I'd only had before at L2O in Chicago when Laurent Gras was still there. 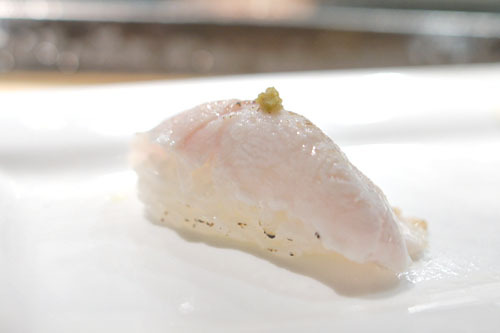 Also known as Japanese butterfish or blue nose, it was somewhat creamy in texture and benign in taste, with a great kick of piquancy from the topping of what I believe was some sort of pepper. Juro-san followed that up with akamutsu, a.k.a. gnomefish, blackthroat seaperch, or deep sea snapper. 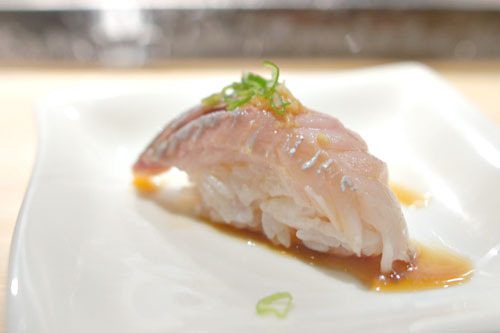 It's a fish that I'd only tried before at Las Vegas' Bar Masa. Tonight, it was fantastic, with a glorious savory char character that paired gorgeously against the salt-spicy jolt of yuzukosho. 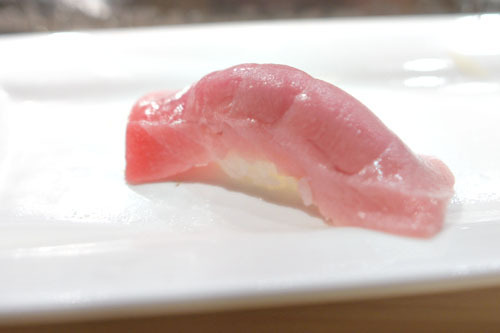 Toro was of the medium variety: cool, dense, fatty, and almost melt-in-your-mouth, though not particularly interesting. Itoyoridai is another hard-to-find specimen. 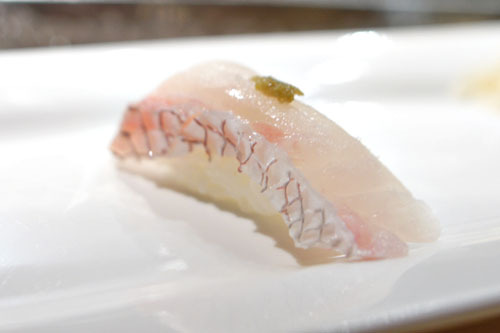 Known as golden threadfin bream, its flesh was lean and subtle, with the shiso and salt here serving as great accompaniments. Our only roll of the night featured lush, creamy tongues of sea urchin, which paired well with the minty shiso notes in the course. Loved the undercurrent of spice here as well. Ocean trout was crisp to the bite, and very full-flavored, with a palpable brine that worked out well with the lemon-y tartness present. 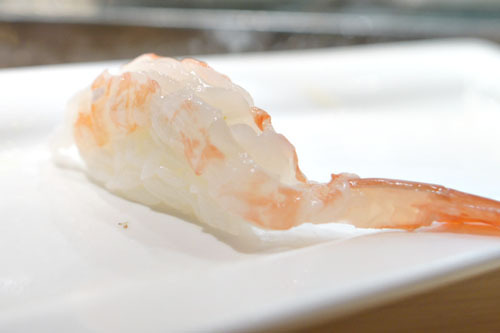 Sweet shrimp was butchered right before our eyes, the result of which was a masterful preparation of amaebi: sweet, creamy, and saline, with certain crispness and spring to it. 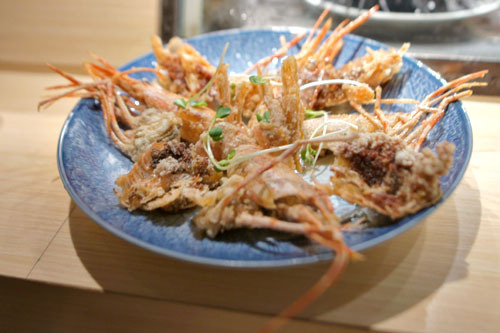 The heads of the aforementioned shrimp, of course, were then deep-fried and brought out. 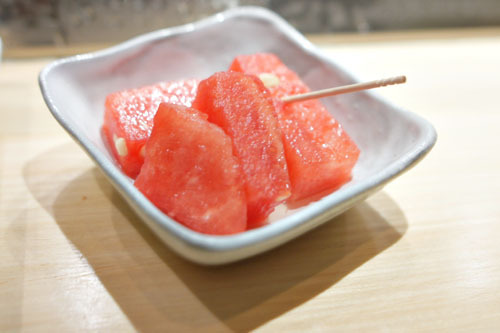 Dessert comprised watermelon, which seemed particularly succulent and sweet. 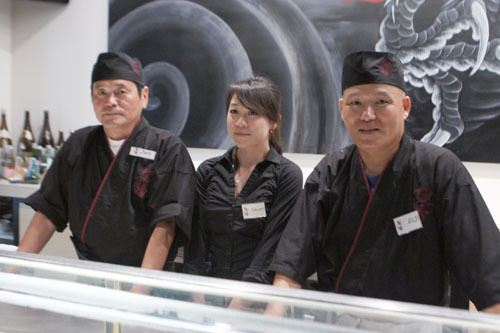 Our itamae Juro-san, along with fellow chef Eiji-san and server Shiori. Have no doubt, Shunka managed to impress. Save for a few minor quibbles, the food here was pretty much spot on, really solid, with a selection of rare seafood that's hard to match. Service was also commendable, as were the chefs' fun, lighthearted demeanors. The restaurant is certainly one of the top sushi spots in OC, and was a fantastic value to boot, coming in at only $58.50 per person, food only. 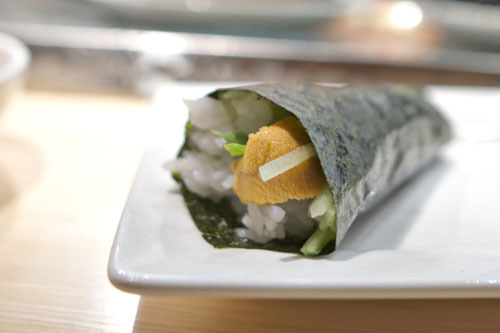 Sushi fiends, take notice. Wow impressed with the variance in seafood here. Shunka seems to be serving some rare and unique fish for a great price. Great post Kevin. Great find (I grew up at Matsu as a child). Would you rank Shunka up there with the likes of Ohshima, Nana San, Shibucho etc.? The quality/price ratio of OC sushi vs. LA is just amazing. could you order a mojito here? That's a great price for the amount and the quality of the sushi. We should go try this place very soon. Thanks for the post! you've been to plums cafe that's next to shunka? awesome pancakes with a really good brunch option. Johnny: Indeed. LA needs to get some places like this. Seems like you can't get great sushi for under triple digits up north. Anon: I'd put it at that level, actually a touch below. Seriously, OC is the place to be if you want value. Charlie: I would hope not, given that it was lunch! Anon: I moved on from the mojito years ago; unfortunately, it looks like you haven't. Eileen: Nice. Let me know if you post about it. Definitely some different types of fish here! I shall try. Does Juro still work there? 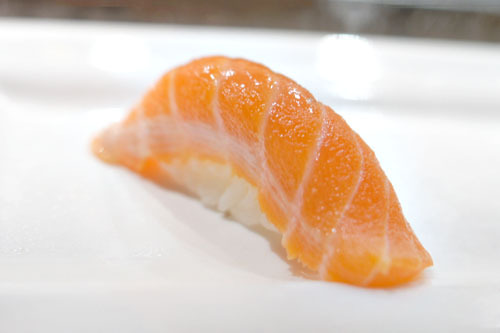 How would the quality/price ratio of OC sushi restaurants compare with Torrance/Gardena?